Documents? You want documents? 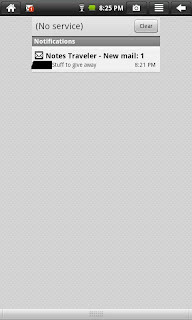 Evidently you also want more screenshots(have to wait till I get home). A number of questions got asked of me since my post this morning so here are more details for everyone. Some of these will just be links to more details, yes, there are many details. Lotus Notes Traveler official homepage at IBM. It has screen shots and some break down by device OS type. First, this is the IBM Wiki with the Android Limitations and Restrictions. 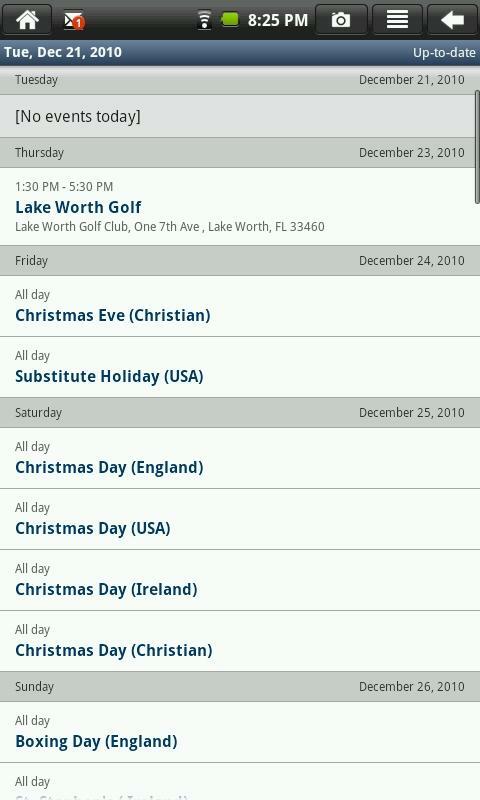 Second, this is the overview part of the Wiki on Lotus Notes Traveler(aka Android's) 8.5.2.1. Third, What's new doc for 8.5.2.1. IBM Mobile Connect is also supported and advised for those that want access to their Domino applications. "no encryption support on traveler for android. You can sign mails on mobile, but can't send or read encrypted mail." Ensuring the security of company information is a top priority for every Lotus Notes Traveler release, and 8.5.2.1 is no exception. 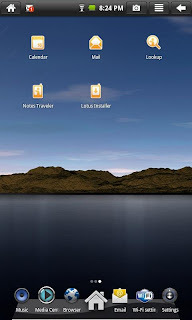 Lotus Notes Traveler synchronizes data (in transit) via secure HTTPS connection and stores the data (at rest) in encrypted form on the Android device. Lost or stolen devices can be remote wiped; either the entire device or just the Lotus Notes Traveler information. Administrators can monitor the mobile user community -- by name, password, device type, build version -- all from a single point of control and allow or deny access for users based on company defined policies. If anyone has more input on this subject, please let me know and I will edit accordingly. 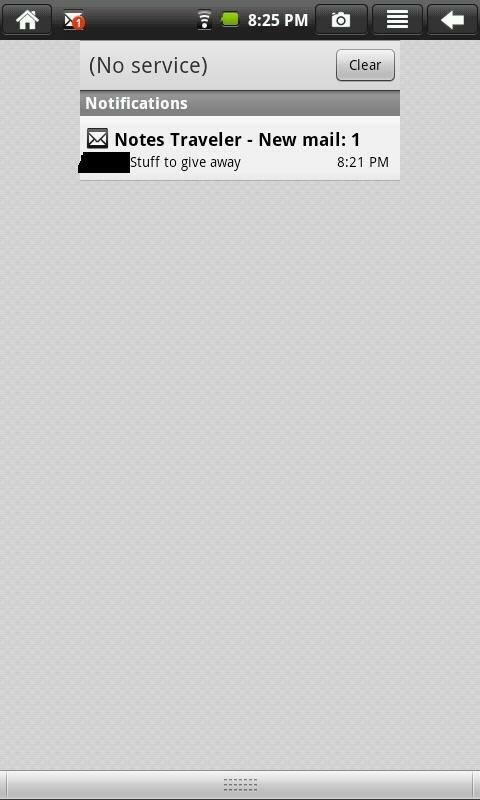 My kids, age 8 and 6 received for Chanukah an Android Tablet which is where the screen shot above is from. 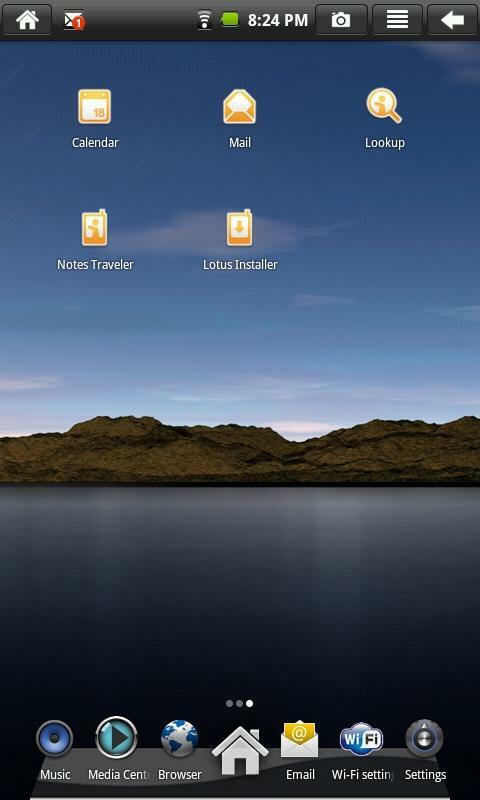 You can see all the icons Lotus Notes Traveler 8.5.2.1 adds to Android devices. And in the top left corner an email with a number on it, that's Traveler letting me know I have email. Lookup is for corporate email contacts. Shame I gave this to my kids. You can click on any of the images to see them in full size. Don't care what the Mac people say, I was not buying them an iPad(cost?) or iTouch(size?). We thought about getting them a new laptop but decided against it. We specifically did not want a device with a camera or extra fees to get online, wi-fi is fine thank you. So we ordered a Black Friday special from ToysRus. It came, I set it up and tried to download the latest version of code and it wasn't having it. Until a few days ago when a new icon appeared, so I updated it and it now runs faster and is more efficient with it's screen size. So I decided to load Lotus Notes Traveler on it once 8.5.2.1 Traveler code came out. Our server was updated the other day so it should work right? Well I am happy to say it does and includes a whole bunch of icons. Not interested in calendar or contacts as I don't need the kids killing my data, but to test out traveler and email on the device I figured was worth it. And it works well. And full of options, unlike my Windows Mobile Phone. 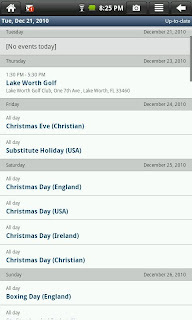 Here is a shot of the calendar weekly view which is very clear and quite clean compared again to my phone. To be fair the tablet has 3-4 times the screen size of my phone. But you get the idea and I am sure your iPad looks and acts similar to this. Could this be created/branded a Lotus device? If one adds on IBM Mobile Connect to get to some apps, perhaps put it in a yellow casing? An interesting idea to pursue. Something Eric and I discussed a bit based on his blog post for new ideas. Ben asked for suggestions, so here is mine. If you think it has any merit, vote for it over at ideajam.net. The problem is this could be a tome, but maybe it will be done in 8 parts. Start with the obvious issues, move to more extensive problems that deal with iNotes integration, SSL, SSO and more. A true collbaorative effort as one person can not do it all, but this is what is on my mind. Admins have the info centers, wikis and blog posts, so do people in the field, but yet many people out there do not trust blogs, believe it or not, but they do trust content in books. This will be a series of books on troubleshooting different products, possibly in some cases like Notes and Domino have separate volumes just on Install tuner, Calendaring and Scheduling, DAOS, ID maintenance, SSL, SSO etc.. The joys of December, cold days, last minute projects, admins that forget what they are doing and blow up their servers. Yes it can happen to you as well, so for all of those who will be up at all hours of the night doing things only IT people do, this one is for you. Ever get a call from an admin on Quickr Dominio saying they can no longer see the Site Administration options, or any other admin type options? I have and since it comes up often enough here it goes, with some other tidbits thrown in just in case you really messed up. First I will walk through what happens then show how to resolve it. I will presume you have previously set up the correct Domino Directory or LDAP configuration which to locate the admins or users. 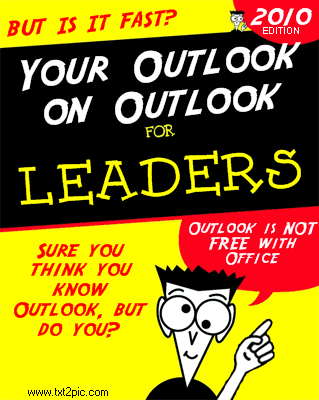 If not, look for more details in my upcoming book from Packt Publishing on Quickr 8.5 Administration available in January 2011. So you have a Quickr server you login to as the administrator. You decide to make sure only admins can create new places on the server. Very good, however watch out for selecting the wrong box. One should see the options on the left on the bottom of your browser screen after you login to Quickr. Click on Site Administration and then see the screen on the left below where you select Security and will then see the screen ont he right. As you can see there are 2 options, first, the who can create new places option, second is the "God" admin role so to speak. In situations like this, someone has inadvertently added an admins name to the first setting, thus knocking them out of the second and so when they login next they lose the Site Administration. Brilliant! So now you go crazy trying to figure it all out but the bottom line is you need to get back in before someone or something needs you to fix things. These steps will help you fix this problem, usually. 1. Open your Server Document for the Quickr Server and set the Internet Protocols - Domino Web Engine. Change server authentication to disabled for the moment. 4. 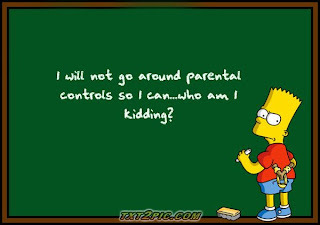 Change the security settings above but this time make sure the correct administrators are given proper full access. 7. Make sure you can see Site Administration, etc..
All should be good to go. Enjoy. My previous post was written in haste and so I want to elaborate further. Ed's post on ASL or Application Specific Licensing hits on a topic many of us have asked for and great to see it is available. I was interested in seeing if the Notes client and Domino for that matter, could be overlayed with our company names. LotusLive will have this so Business Partners can White Box a solution and we look forward to it. While I have been told it is either available or coming, I have not received any more details yet. So if I am wrong, or missed an email, someone please let me know. Why would I want to white box Domino? Just to make life easier on customers. White Boxing Lotus Notes could be interesting, imagine if Openntf could White Box it with all the apps and openmail template added inside? It is an interesting idea to propose an open system. Naturally this is not an easy sell to large customers but if they knew IBM was behind it at some level it may have legs. Imagine going into an Exchange shop and showing them 8.5 and under a new moniker? If you don't think so, you never showed a customer using outlook or Notes R5,6,7 still what the 8.5 or iNotes client are like. They love it. 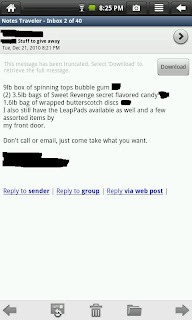 We received this email from someone that we were referred to by a client of mine. Think I am from a different business world, sending out missives that read like a bad form letter in a Dilbert cartoon can't possibly make someone a client...can it? I was refereed by your client to get in contact with you regarding your business communication services. I’m currently working with Mr. X in your other office to streamline their communications and have a positive effect to their bottom line. Please contact me at 555-123-4567. I would like to sit down with you on Tuesday at 1PM. Please let me know if that is a good time for you. If you or your company are sending emails or letters like this out to potential partners, customers or clients, please stop it. Obfuscating your solutions will rarely impress someone. Executives fear what they don't know. While some may have an interest to check on this, most will either ignore it because they have no idea what you are talking about or worse tell people never to use your company because you talk like a Dilbert cartoon come to life. This reminds me of the old Dilbert Palm application that you put in your name of the business and services and out came a mission statement for you to use. Or maybe they used one of these instead. If you can't speak as normal people speak what makes you think anyone would want to talk to you? To be fair to him, I let him know we had made some decisions and he could call me out of respect for my clients reference. 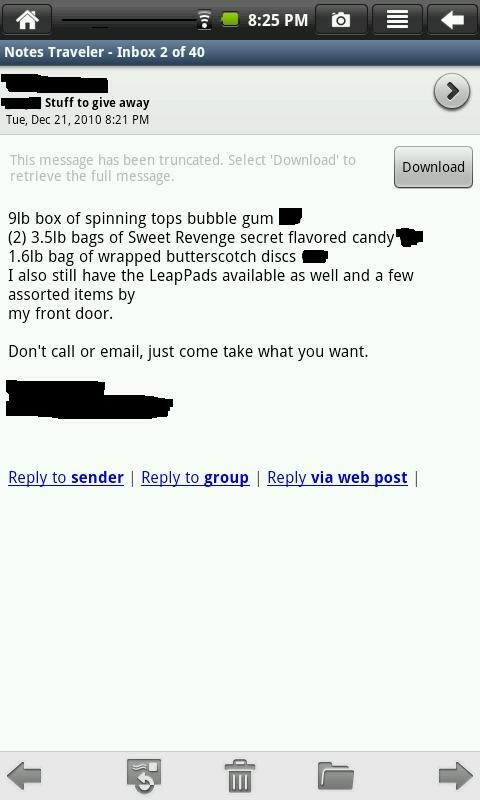 You never know he may have something, but if this was not a referral it would have been deleted faster than Ricochet Rabbit. Been debating this for quite some time but it comes up quite often. On one hand, some IBMers get paid on selling licenses, others get paid on Cloud initiatives. On the other hand, as an example, Lotus Connections IBMers would prefer if clients bought licenses instead of LL Engage. This short lived cannibalization of sales and internal posturing is not unique to IBM. Microsoft has similar issues, especially when confronted with losing major money from their #1 money maker, Office. So what is a Business Partner to do? Naturally offer clients the best of what is available and make the proper choice. Not just select the one that pays more commission. And on that note, Cloud options pay much less, as if there was any doubt. So what can the mothership do to resolve this dilemma? One thing to do is compensate everyone, internally and externally, equally for the products. Really, what benefit does it serve to have it any other way? Another option is to provide equality to all products and let the PC side be equal to the Cloud side. If someone owns one license, they should get one Cloud account for free. I understand this may reduce revenue, but this also provides an excellent way to work in the interim while companies try to decide their future directions, or more importantly when they will make the leap, if ever. Charging twice is just not a nice option. Lastly, applications are needed. No offense to the great marketers out there, but just going to the cloud, without a real application, I do not consider social media or Office related tools as applications, doesn't have enough excitement by itself. What would be exciting? Let your imagination run wild. Apps are after all the lifeblood of the Apple Store. Could that same be said for Domino applications? Keep in mind I am not a developer so let's keep this light for now. Some have tried to sell apps at a similar pricing structure as Apple, some aim at the corporate solution side and pretty much every IBM Business Partner falls somewhere on the spectrum. And there is the free side of apps available at openntf.org too. What possesses them all to keep writing applications for a product Microsoft considers dead? Some argue it is the speed of creating the application. You may know it by the more familiar acronym RAD, Rapid Application Development. And we don't mean a simple one off web page or Notes application that could be done in an hour or 2 or 5 minutes depending on one's prowess. We mean a full featured work flow application or expense report or HR resume collection and processing system. Or a clip board application that synchronizes to a main office via email from the field? The forward thinking of us realize that there is more to the universe than pure Domino applications as well. The recent announcement about Lotus Connections being bundled with Cognos should lead to a number of interesting applications and plug-ins. So there is a variety within Lotus for everyone. Naturally companies are loathe to drop any application that runs their business, but the forward thinking companies want to keep that application but move it to the modern times via web apps or mobile device apps. If you asked someone to take the old apps and rewrite them in a new program, and if the original was a Lotus Notes/Domino application, it may not be so simple. Much of what Domino does in the background natively, would need to be coded from scratch in most other systems. A daunting task in time and money usually. So if apps are the Holy Grail, why does it matter which platform you right them for? After all, the user never sees the server. And if it is on the web, isn't that all anyone cares about? The beauty of Domino applications is that a simple flat database could on one hand be an object store but also be the front end UI or the highly interactive forms in a workflow or just as well connect to nearly any depository to manipulate the data in some way shape or form. Could you do the same in other systems, sure, but the expense and effort would possibly out pace the value of the application. What about the not so corporate world? What do roofers do? Window hangers or painters? Hair Salons or fitness gyms? They can't always enjoy the benefits of such a "large" system...or can they? Some have a program in place, sometimes a niche product for them, other times a self written one or just a generic one of the shelf. Without being able to easily edit or manipulate these programs, are they really being useful? Would a cloud or purely web solution be more beneficial in these cases? Especially one with a mobile app? Yes indeed and maybe this is an emerging market for some of you. Others may sniff and say it's too small, but everyone started small at some time. Their applications could be created and leveraged as quantity grows to provide even more benefits than the previous solution, if they had one at all. Like restaurants having an ordering menu for phones which may cost as much as 5 figures in development expense, the benefit is seen over time not all at once. That flexibility, to have an app written by someone else, but then change your menu whenever you need is priceless to that restaurant owner. No one wants software that is difficult to use or learn, they want plain and simple. But here is the problem, to these companies the app has to be cheap enough while in corporate the same fee would be seen as too cheap, believe it or not it can be viewed this way. Right now as I look out my window I see delivery trucks, fitness runners, garbage collectors and other business people and each of them could benefit from a simple application, but can you nail the price point? Sure we could put together something to demo for them in a few hours on Domino and it is what they may want or need? But can you sell it to them? If so, then go do it, if not, find your niche and work it. Talk to your clients, find out what they are looking for to get done, maybe not today but down the road, and start a skeleton of that project to demo. The beauty of Domino is even a non-developer can really make some good use out of it, if one has the interest. Got the interest? 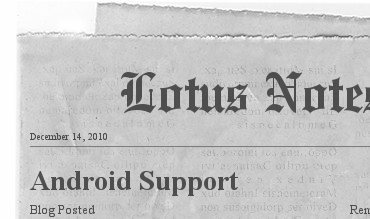 Go download the Lotus Designer client for free and see what you think. This post from the other day provided a number of comments, IMs, discussions with IBMers and some funny stories from friends who just don't get any of this. One comment, anonymously posted, suggested that it is wrong to recommend a product without knowing the business reason, or any reason for usage, first. My thoughts are yes and no. Do I recommend an IBM product every time to clients....yes, if one exists that meets or exceeds their needs. We are an IBM Business Partner, why would I suggest otherwise. 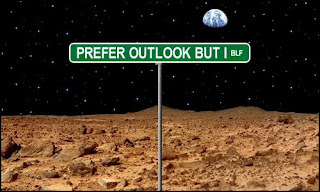 Some will argue not everything IBM sells is better, my clients do have a brain and we are only recommending them these options, they choose what they want to use. Now, if there is something which is not in our portfolio, I will research the information for them and we will find something to resolve the request. For instance a print to PDF driver, which is not inside Lotus Notes. When someone says they need a secure file storage online and offline accessible. My immediate thoughts are Domino applications, Quickr, Connections or for "Cloud" options LotusLive Engage, LotusLive Connections. Are these the best choices? Is SSL better than secure ID or VPNs? Is there really any difference between a BMW a Lexus or a Mercedes? The answer is subjective. We don't demand or expect clients to follow us like sheep, but we do spend time educating them on why our decision makes valid sense given their infrastructure, budget and project requirements. Could any one else argue the same points, perhaps. The point is not lost on me or others. But how many companies are still relying on a product that has been dead for years but runs core applications. Foxpro? I just heard about 2 companies still running versions I haven't seen in 15 years. Lotus Approach? WAY too may people still use this relational database. Dead product? Not quite, it is still available as a download from IBM, or was the last time I checked. Office 2000? 10 years later and it keeps going and going and going. Same with Windows server 2000 and 2003. You can laugh at these and most likely readers have even more hidden old apps you forgot about over time. But these all have in common a purpose that at the time was a valid purpose and keeps them running still to today. Were there other choices out there? Most definitely. But someone, a sales person usually, convinced them this was the way to go and if it lasted this long, they were correct. The people that I meet on Twitter related to Lotus Quickr(and Quickplace) are using a product that not only lives and breathes and is updated quite frequently by IBM, it also is managing projects that run their companies. Why don't they go to Sharepoint? Why not some open source product or cloud based offering? Because their needs were defined and the product fit. Should every group or person use Quickr in their company? That is debatable. Could every one benefit from using Lotus Connections? In the long run yes because the more you as a company know about your employees and customers, the better your business lines can go to market with new products or manage to impress customers by your usage of Business Intelligence to find out what they need, like or want. In the short run, the answer lies in how you roll it out and get buy in from your executives and then the employees themselves. If you do not understand what Lotus Connections is or never heard about it and want to try it out, we suggest you go to the Lotuslive website and register for a 30 day trial of Lotuslive Engage or Connections. Or if you want to be more interactive, setup an account on the Lotus Greenhouse site which runs all the Lotus products and is used by IBMers, Business Partners and customers, some as though it was a real and not demonstration site. If you do use it, you can find me on the Greenhouse Sametime server which has an excellent group of people on it as well. Once you do that, drop me an IM or email and we can talk more about what you want to do or how to do it. Not every product meets every need, but every need does meet a product. Engage is an excellent cloud offering from IBM. Imagine getting a mixture of Lotus Connections and Lotus Sametime...and only paying about $5! Need to do easy webinars? Use the built-in Sametime meetings. AND record them. Want to profile employees and cull more information about your business from them? Set up your profiles. Want to work on projects or defined spaces for client work? Use Communities. As an Admin you can control how files are shared by default or allow people to make their own choice. 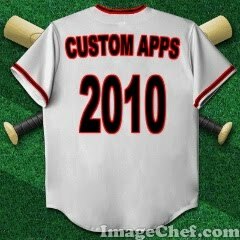 Customization includes color schemes and corporate logo. Simple but meaningful. FREE Add-ins, for FREE, really, include Salesforce.com, Tungle which allows for interaction between one's calendar, no matter which system you are on, Skype, UPS, Silanis which provides secure digital signing of documents, Vondle which is a file viewer and no doubt more will be coming soon as well. 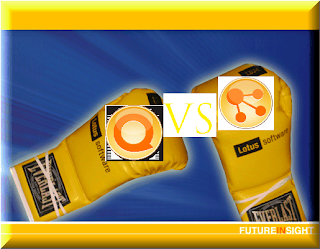 Lotuslive Engage can help smaller companies who do not want to have the added expense of servers, licenses and support. Larger companies can be more agile by making these tools available worldwide(19 languages) and save a ton of money that way as well. It also makes for a nice demonstration/testing environment when looking into the full on premises packages. For more details and compare the LotusLive choices, you can see this page. If you need help in understanding how to integrate this into your organization just ask me or if you are at LoLA I will be here all day.